I’m making a nasty joke here, folks. The actual title of this book is Detective: The Story of a Trail-Blazing Cop Who Wouldn’t Quit. But I have a whole lot of issues with this book, not the least of which is the incredible bias of the author, followed by her self-indulgence. While her story is an interesting one, and covers many important issues of the NYPD, I found that her incredible bitterness ruins it. Kathy Burke became a New York City cop in the late 1960’s. It was right at the time where the women officers were going from the job of matron, who booked and searched women suspects, to doing real police work. 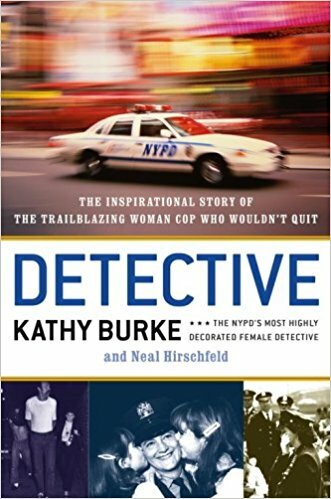 According to Burke, there were a sizeable number of women detectives in the department, and the main reason is that the women were needed as bait. She ends up masquerading as a college student, drug user, high school kid, and other characters in order to catch drug dealers. The problem is that the men who were supposed to be watching her goofed off, and she get stabbed. Several lessons were learned that day; first, the women were disregarded, and second, the worst thing you can do is let your colleagues get in trouble. But that incident had one advantage – it got her a detective’s shield! Ironically, Burke was facing far more dangerous work than any of the male detectives. She didn’t have any advantage of size, wasn’t a skilled fighter, and was in the type of undercover work that could get her killed. In her 20 years in the NYPD she dealt with dealers, bank robbers (including a six-foot-ten that she collared twice) and others. Unfortunately, she dealt with a lot of sexual harassment from her supervisor, and that led to her suing the NYPD over withheld promotions. She won the lawsuit, and soon afterwards the NYPD stopped using the terms patrolman and policewoman, opting instead to call them all police officers regardless of gender. My problem with her story is that she has annoying prejudices against the people she’s dealing with. In the earlier part of her career, she went undercover to bust a lot of teenage drug dealers, usually going into the schools, taking advantage of her youthful appearance. A lot of the teens she found dealing were from well-connected families; one of them was the daughter of a district attorney. But then she starts saying that she despised these teenage dealers, and it’s clear that she still does. I would like to know why she despises the kids, not the parents who let them do it? She also writes about how the patrolmen who arrested her would make lewd remarks about her in the car. Why doesn’t she despise those men more than the teenage pot dealer? The ending of this book takes the cake. She and her colleague get shot while doing surveillance of a Mafia gambling operation; he dies, she gets blames by everyone for her his death, and the mob gunmen who did it are acquitted. Everyone (including the prosecutor) makes her out to be a pushy woman getting above herself, and she leaves in a big huff. The problem with this is that there are too many unanswered questions. Firstly, a cop doesn’t normally get the blame for another’s death if she too gets shot, so why was everyone so quick to blame her? Secondly, she says that she was harassed by cops who wanted her to drop the charges against the men who shot her, and that doesn’t make sense. Lastly, when I looked up this story online (including the book’s reviews) I found so many cops who disputed her version of the story. They all say she fled in the car and left the other cop to die. If they are in fact wrong, what incentive do they have to say those things? One of them suggested that her husband, a high-ranking NYPD captain, helped cover things up. Someone here is not being truthful, but who? I don’t know how to categorize this book. Should I call it a woman’s memoir of the NYPD? The change in the NYPD’s attitude to women officers? A book about sexual harassment? I hope things have changed in the department, at least in comparison to what she went through. Other than that, there isn’t really much to learn from this book. There’s another autobiography by a former decoy detective named Mary Glatzle, AKA “Muggable Mary,” with similar stories of working undercover, yet the latter was a lot more enjoyable. Also, Detective Glatzle doesn’t have the huge prejudices that Burke has of her days in the department.